Doris Mobley departed this life 12/30/2018 to join her true love, Brooks T. Mobley, in heaven following a six year battle with Alzheimer’s. Doris was the second youngest of the 12 children born to Charles Provine Grissett and Nancy Virginia Snook on the family farm in Grimes County, Iola, TX. She grew up picking cotton and helping with chores at home and on the farm. From her Mother she learned to make the best fried chicken, cream gravy and cornbread you ever ate. A true Texas wildflower, Doris adapted and bloomed wherever she was planted. Upon graduation from high school, she moved to Houston to attend secretarial school and lived with her older sisters Martha and Sarah. One of her early jobs was working as a secretary for noted Texas jurist and politician, Judge Townes. In 1945 in Houston she met Brooks Trueheart Mobley at the U.S.O. Brooks married his “U.S.O. Commando” as he called her in 1946. They moved to Duvall County and their only child, Robert was born in 1948. While Brooks worked for Humble (Exxon), Doris worked as a secretary for the Texas Company (Texaco.) The oil camps in Freer closed in 1960 and the family moved house, literally, to Falfurrius TX. A second house and all move occurred in 1964 when the family moved the 38 miles to Kingsville. When Robert went to college, she started a new career as a real estate agent for Century 21. She was often the top listing agent in the office. Brooks passed away in October, 1979 and Doris moved to Houston to be near her family. The birth of her grandson Edwin Brooks Mobley in 1986 prompted Doris to move to Austin. Grandma was her favorite job. In 1990, a granddaughter, Anna Brigitte Mobley was added to the family. When she was not helping with the grandchildren, Doris played bridge at the Senior Activity Center on Shoal Creek and the Dittmar Recreation Center. 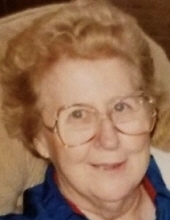 Doris resided at Englewood Assisted Living for several years but moved to Sodalis Memory Care of Dripping Springs 6 years ago when she could no longer live on her own. The family would like to thank all the employees at Sodalis for the love and care they have given Doris in these last years. She was treated like family, not just a patient. Doris was preceded in death by her parents Charles and Nancy and her eleven siblings, William, Jacob, Sarah, Mary, Charles, Daniel, Martha, Edwin, Martha, Alf and Ellen. She is survived by her son, Robert Brooks Mobley, grandchildren Edwin Brooks Mobley and Anna Brigitte Rubio (Patrick) as well as four great grandchildren, all of Austin, and innumerable nieces, nephews and cousins. To plant a tree in memory of Doris Grissett Mobley, please visit our Tribute Store. "Email Address" would like to share the life celebration of Doris Grissett Mobley. Click on the "link" to go to share a favorite memory or leave a condolence message for the family.